The park is accessible from exit 120 off the Garden State Parkway and from Route 34. State Park signs are posted at critical intersections along the following routes:GSP, Route 34 South and North. For more detailed directions click here. Office Hours: Monday - Friday 8am - 4pm. 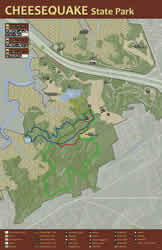 A striking example of vegetation change along a gradient from coastal salt marsh habitat to upland forests can be observed from the various trails running through the natural area. 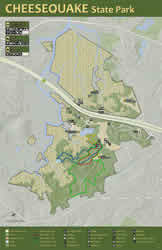 The natural area displays a diversity of plant species and community types characteristic of both northern and southern New Jersey. The Nature Center is located a short distance from the trailhead parking area on the Red/ Green/ Blue trail. Visitors are welcome to view the wildlife historical exhibits throughout the Center. 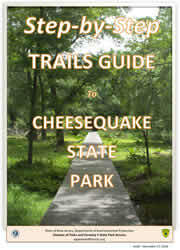 Visitors can learn about the three habitats located within Cheesequake State Park. The Center also provides information on the Native American and early colonization of the area. The center is open from Wednesday through Sunday, 8:00 am to 4:00 pm and seven days a week from Memorial Day through Labor Day. The Nature Center provides weekly interpretive programming focusing on a variety of seasonal topics. Please contact the Interpretive Center for details at (732) 566-3208. Program fees may apply. There are five designated trails at the park. The Red, Yellow, Green and Blue pathways are for hiking and walking use. The White Trail (multi-use) is designated for hiking and mountain biking. Trail lengths range from 1.5 to 3.5 miles. Trail difficulty ranges from easy to moderate with inclines. There is an 11-foot height restriction for vehicles entering the Camping area. Pet Friendly Campsites please click here for details on sites that are designated Pet Friendly, license and innoculation paperwork requirements and additional cost. Pet friendly sites are family campsites #23-27 and #37-40. Campsites: There is an 11-foot height restriction for vehicles entering the camping area. 53 tent and trailer sites with fire rings and picnic tables. Flush toilets and shower facilities are within walking distance. Trailer sanitary station available. Open April 1 through October 31. Fee: NJ Resident $20 per night; Non Resident $25 per night. Group campsites: The Gordon Field group area has fire rings, upright grills and picnic tables. There are six individual sites accommodating up to 25 campers each. The area facilities include flush toilets and potable water. Trash must be carried out. Open May 1 to October 31. Fee: NJ Resident $50 per night; Non Resident $100 per night. Please contact the Park Office for application information. The six-acre Hooks Creek Lake offers an opportunity for freshwater fishing. Trout, Largemouth Bass, Catfish, and Sunfish provide the angler with a variety of freshwater species. Fishing is subject to all NJ Fish and Wildlife regulations. Crabbing is also available from the Crabbing Bridge which is reachable from the lake parking area. The bridge and walkway are ADA accessible. There is an 11-foot height restriction for vehicles entering the group picnic area. NOTE: No alcohol is permitted. Trash must be carried out. 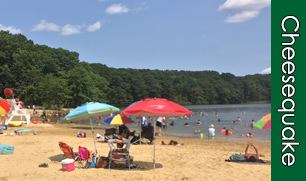 Swimming is permitted in Hooks Creek Lake while lifeguards are on duty. Please check our swimming schedule prior to your visit. Visitors will find a beach complex containing changing area, restrooms, a first-aid station and a concession offering refreshments, novelties and beach supplies. Inner tubes, rafts and other flotation devices are not permitted in the swimming area. Only Coast Guard approved life jackets are permitted. Pets are prohibited on the beach. Sledding is permitted on the hill adjacent to the Hooks Creek Lake parking area. Cross-country skiing is permitted on the roadways and field areas. Snow shoeing is permitted throughout the Park. How do we go about making a camping reservation? From the GSP: Take exit 120 and make a right at the end of the exit ramp and follow to the first light. Make a right. At the next light make a right and follow road into the Park. From Route 34 South: Make a left turn onto Disbrow Road which is the light immediately south of the Marketplace Shopping Plaza. Make a right at the end of Disbrow Road. Make a left at the first light and follow into the Park. From Route 34 North: Make a right turn onto Disbrow Road which is the light immediately north of the Berg Animal Hospital. Make a right at the end of Disbrow Road. Make a left at the first light and follow into the Park.